Map of a Tuareg grazing route made by Kili Kilu Ag Najim and modified by Edmond Bernus. Orientation is north. The map covers an area 150 kilometers east-west and 90 kilometers north-south. 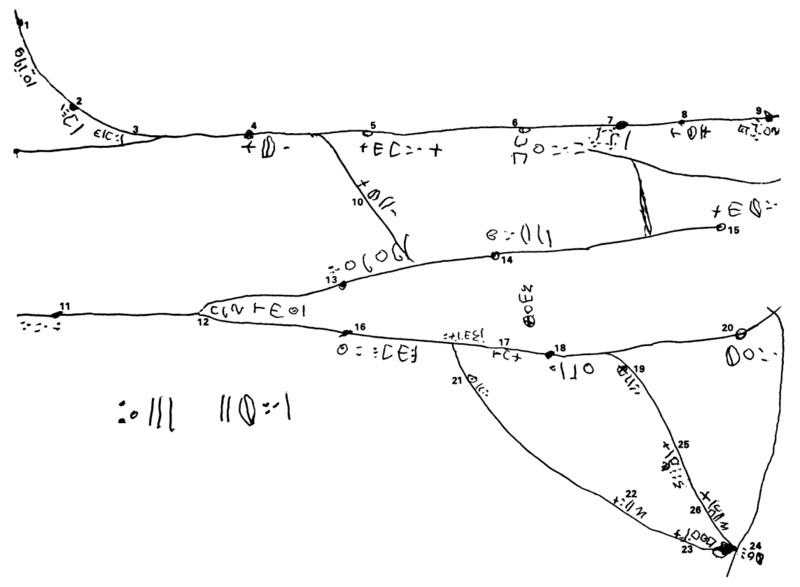 Place-names are written in the Tifinagh script. The lines represent dry valleys, and Bernus identifies twenty-six local place-names and wells (numbers 1-26 on the map). This photograph taken in 1968 shows a Tuareg woman of the Kel Adagh group in the Adrar des Ifoghas massif (Mali) drawing a map of the Ouzzeine Valley in the sand, showing its main axis and its perpendicular branches. In the 1970s, the French geographer Edmond Bemus asked Tuareg herders in Niger to map their dry-season grazing areas. This is one of five maps published by Bemus that were initially drawn in the sand and then put on paper by Tuareg informants. The map’s linear form reflects the pattern of relict river valleys along which Tuareg herds graze during the dry season. The small numbered circles mark the position of wells along the valley floor. Place-names are written in the Tifinagh (ⵜⵉⴼⵉⵏⴰⵗ) script. The map’s focus on hydrographic networks reflects Bemus’s request to show transhumance routes. While this map is oriented to the north, interestingly, the orientations of the five maps vary with the position of each mapmaker in relation to different grazing areas. This illustrates the point that pastoral nomads use “sectors of orientation” to situate themselves more often than they use fixed cardinal points and directions. As Bemus shows, the paths along which the Tuareg orient themselves are commonly associated with physical geographic features such as stream beds, sand dunes, hills, and isolated trees in the landscape. Orientation is also determined in relation to Mecca, which devout Muslim Tuareg face five times a day while praying. Among the Kel Ahagger, east is called elkablet, which means “the direction of Mecca.” East is also denoted by the word dat-akal, defined as “the country in front” of the person in prayer. West is defined as “the country behind” (defter akal) the person praying. North and south are equally defined in relation to the person facing the sacred easterly direction. The word for north is tezalge, or “the left” or “the left side,” while south is denoted by aghil, or “the right.” The practice of defining cardinal directions in relation to the human body facing a specific geographical feature or direction (left-right, front-back, up-down) links the Saharan Tuareg with the peoples of sub-Saharan Africa. In the central African rain forest region of Kasai, individuals commonly orient themselves in relation to the flow of rivers.